Sen. Elizabeth Warren (D-MA) released her DNA tests recently, and it showed what we’ve known for years: she’s not really Native American. The allegation has hung around her neck since 2012. Warren has claimed that she has Cherokee ancestry. She doesn’t. She is 1/1024th Native American. I have more Native American blood than Warren…and I have none. All credit for that line goes to Donald J. Trump. If this is the new benchmark established by liberals to shield their own from terrible acts of cultural appropriation for personal gain, then I guess we can be whomever the hell we want. NBC political reporter Jon Allen said Wednesday that Sen. Elizabeth Warren's (D., Mass.) DNA test, which she could be between 1/64th and 1/1024th Native American, shows she committed "some level of fraud" by claiming Native ancestry in order to benefit from affirmative action. "The people that are most offended by this are people who believe in affirmation action," Allen said during an interview on the "Bill Press Show," "because they're like, ‘Elizabeth Warren didn't need affirmative action.' She perpetrated some level of fraud, and that hurts affirmative action." "She wanted to get it behind her before the midterms," Allen said when explaining why she did the DNA test and announced the results at all, "so she could have a clean slate to go in." Warren released the results of her DNA test on Oct. 15, framing the results as confirmation of her Native American identity. Cherokee Nation issued a statement in response, saying DNA tests have no bearing on tribal affiliation and that her actions were "undermining tribal interests." "Using a DNA test to lay claim to any connection to the Cherokee Nation or any tribal nation, even vaguely, is inappropriate and wrong," his statement continued. "It makes a mockery out of DNA tests and its legitimate uses while also dishonoring legitimate tribal governments and their citizens, whose ancestors are well documented and whose heritage is proven. Senator Elizabeth Warren is undermining tribal interests with her continued claims of tribal heritage." 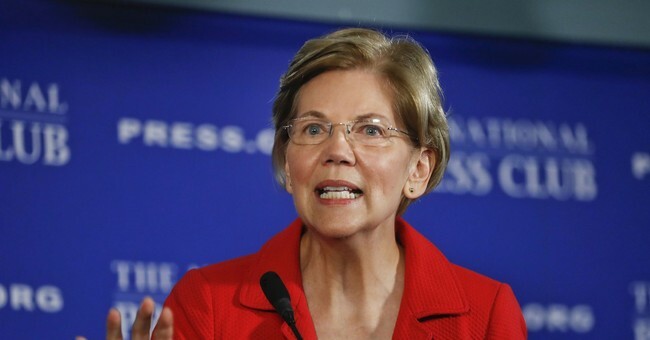 Prompted in part by President Donald Trump’s derisive references to her as “Pocahontas,” the Massachusetts senator made her DNA test results public last week, which indicate there is "strong evidence" she had a Native American in her family dating back 6 to 10 generations ago. Controversy over her ancestry has dogged the Massachusetts Democrat since she ran for Senate against former Republican Sen. Scott Brown in 2012 and the move was widely seen as an effort to help clear the path for a prospective 2020 presidential run. Broken down by party, 57 percent of Democrats said Warren's big reveal made "no difference" in their opinion of her. The same was true for 40 percent of Republicans surveyed. Morning Consult polled 1,968 registered voters was conducted online Oct. 18 and Oct. 19, several days after the DNA test news broke. The margin of error is plus or minus 2 percentage points. So, after years of harassing, protesting, and whining about so-called cultural appropriation, the Left is circling the wagons around a white woman who straight up committed the worst sin for this beautiful mess of an ideology. They’re defending a white woman taking a racial status that’s not hers in any way, shape, or form. Oh, and you bet that Warren isn’t apologizing for it. What a time to be alive, but also shows how Democrats continue to fail miserably to police their own. Lie-a-Watha has been exposed at least.